What can we learn from the church carbon tax fiasco? Browse: Home / Uncategorized / What can we learn from the church carbon tax fiasco? Yesterday morning, United Conservative Party candidate for Brooks-Medicine Hat and well-known conservative activist Michaela Glasgo tweeted a claim, since debunked, that her church, Hillcrest Evangelical Missionary Church in Medicine Hat, would be facing a $50,000 bill from Alberta’s carbon tax next year. The claim, and the subsequent challenges to it, were picked up by the Edmonton Journal, the Toronto Star, and other media outlets. Through the day today, Glasgo first doubled-down on the claim and then, after her church clarified that the true impact of the carbon tax on their annual operating costs was $5400, not $50,000, backed away and recanted. Glasgo is now being piled-on from anyone and everyone on the left. Rather than pile-on, I think there’s a lesson here that we all should learn. One of the challenges of carbon pricing has always been that the units are abstract: tonnes of a gas? What? I’ve had the opportunity to talk to people across Canada about carbon pricing and one thing which is near-constant is that people have little-to-no idea how their own lives translate into tonnes of emissions and then, once a carbon price is applied, how those decisions will translate into an increase in costs. Without looking at your monthly bill, how many gigajoules of gas does your household consume each month? How many kWh of electricity? What about your employer? Your favorite store? You’d likely be lucky to guess it within an order of magnitude in some cases. I’ve sat at boardroom tables with executives and directors of large emitters and asked them to tell me the emissions-intensity of their firm’s production. The ranges in replies I get are often an order of magnitude wide. You’re not alone. How many tonnes of emissions does a church emit? It turns out that the answer in Hillcrest’s case seems to be about 180 tonnes per year. But, was that number obvious to you or was it the size of the $50,000 number that threw you for a loop because it just seemed too high to be plausible? For me, it was the latter. Once I’d decided that I wanted to know more, I followed the same path that others did: I boiled it down to units of average households. Given Alberta’s $1.517 per GJ carbon tax on natural gas, a $50,000 tax bill would translate to 32,960 GJ/year. The average Alberta house uses 120 GJ/year so I figured that it was implausible that a church building would have the energy consumption of hundreds of homes. Others went a bit further – one twitter user worked out that the average single detached home in Alberta uses 0.045GJ per square foot per year which, if you assume comparable heat loads, would imply a church about 1/8 the size of the West Edmonton mall. Not likely. 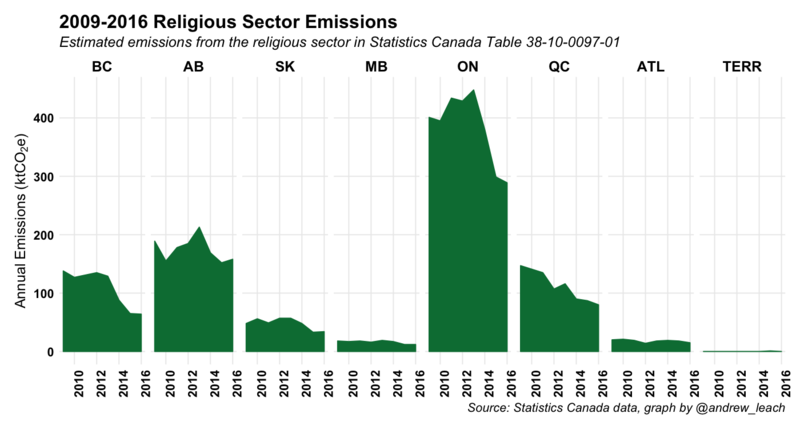 I then went in another direction – I used some new Statistics Canada data to look up total religious sector emissions in Alberta. It turns out that annual emissions from the sector in Alberta is about 160,000 tonnes per year, assuming little has changed since 2016. I graphed religious sector emissions by province for your enjoyment below. For Glasgo’s church to have a $50,000 tax bill, her church would have made up about 1% of the total emissions from that sector in Alberta in a year. Again, that seemed implausible. But, here’s the thing – the reason her soundbite was challenged, or at least the reason I dug into it was that it conflicted with my priors. It didn’t seem right. It made me wonder how many similar estimates I’d let slide by because they didn’t conflict. Psychology and, more recently, behavioural economics, has taught us the power of confirmation bias. If you’re a conservative today, you’re ready and willing to believe that all the ills in the world are caused by policies implemented by Justin Trudeau or Rachel Notley. Perhaps you’re even working hard to build on some of those biases in your voters. Sometimes you’re going to get caught up in your own narrative. When Jason Kenney tweeted, in response to Glasgo’s claim, that, “we hear stories like this all the time, sadly,” he was (perhaps unintentionally) very perceptive. Yes, every day, politicians are likely to hear anecdotes which either misattribute causality or exaggerate impacts. As we move into campaign mode federally and provincially, candidates and supporters will have a choice whether to amplify these anecdotes. Perhaps Glasgo’s tale will give everyone pause to ask, “does this really make sense, or am I only willing to believe it because it confirms my biases?” If this causes a moment of pause before amplifying potentially false messages, then we’ll all have benefited from this episode and we’ll have better, more informed debate. Plus, more of you likely know how much energy your house uses. Of course, maybe the idea that people are, fundamentally, looking for truth rather than partisan advantage is just me trying to confirm my academic biases.